The discovery of the Higgs Boson particle, more colloquially referred to as the "God Particle", helped solidify our basic understanding of particle physics and matter- but could it also have the power to wipe out our universe? Steven Hawking has never been a fan of the Higgs Boson particle. When the particle was identified back in 2012, he said the discovery made physics less interesting. Recently, in the preface to "Starmus", a collection of essays and lectures written by the theoretical physicist, Hawking warns that the particle has the potential to destroy the known universe. The notion of a "Higgs Boson doomsday", where a quantum fluctuation forms a vacuum that consumes all of time and space, isn't just some fleeting theory. The idea has been circulating around in the scientific community for quite a while now, but scientists doubt it could happen anytime soon. Joseph Lykken, a theoretical physicist at the Fermi National Accelerator, said, "Most likely it will take 10 to the 100 years (a 1 followed by 100 zeroes) for this to happen, so probably you shouldn't sell your house and you should continue to pay your taxes." 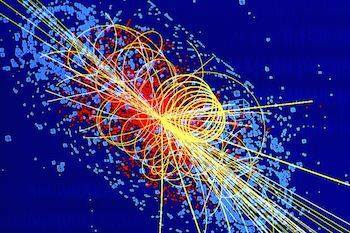 The Higgs boson, a tiny particle that signals the existence of the Higgs field that gives mass to matter, is about 126 billion electron volts- or about 126 times the mass of a proton. This charge happens to be the exact mass needed to keep the universe on the brink of instability, but physicists say the delicate state will eventually collapse and the universe will become unstable. That idea comes from the belief that the Higgs field is undergoing changes in order to achieve equilibrium, which could trigger an unfortunate series of events that lead to an all-consuming vacuum. And, in turn, an instantaneous demise for life as we know it. But, just as the discovery of the "god particle" proved back in 2012, we have yet to discover all there is to know about the universe. Lykken points out that yet-to-be-seen factors, like dark matter and "supersymmetry", could prove this end of the world scenario to be an unnecessary worry. "We found the Higgs boson, which was a big deal, but we're still trying to understand what it means and we're also trying to understand all the other things that go along with it." For more Science and Tech news, check out this article about the Grandfather Paradox!